Oluwalase Babatunde Benson lives in a small village somewhere in Africa. 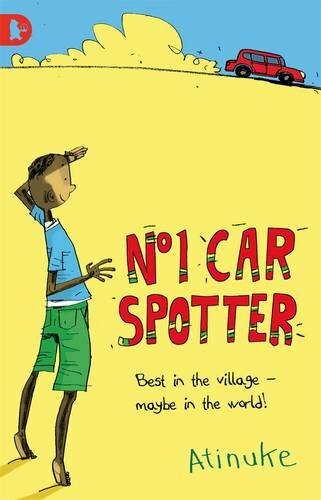 He’s known familiarly as ‘No.1 car spotter’ by friends and family for he can identify every make of car that goes by on the busy road that passes the village. His interest in cars is huge, a passion handed down by his grandfather. But in a community in which everyone must pull their weight, car spotting, he knows, is not talent enough: yams and mangoes must be harvested and foodstuffs taken to market. The story describes No.1’s everyday adventures. Fun-loving and cheerful, he puts his natural intelligence and problem-solving skills – and sometimes his knowledge of cars – to good use. Identifying customers for Mama Coca-Cola’s roadside restaurant, finding a way to replace the cart when it snaps in half, learning about the importance of cosmetics in women’s lives and unwittingly helping his dad find work are all experiences that help him to find out about the world and his place in the community. The book is divided into four self-contained episodes or chapters that can be read independently or as a whole. The episodes are realistic and contemporary, written with ease and humour, with sympathetic characters and lively dialogue. The sense of community and place is vital to the unfolding of events. This is an impressive debut, the first book in a series to watch out for.